The Cannes Film Festival, like Comic-Con, SXSW and certain parts of East London, is one of those things that’s utterly fascinating to everyone who’s there and completely uninteresting to everyone who isn’t. Knowing this makes covering the festival quite hard — after a bit of trial and error last year, I quickly realised that the vast majority of people who read this blog aren’t interested in a nine-month-early review of the new Nuri Bilge Ceylan movie — so this year, in an attempt to keep things vaguely interesting, I’m going to be doing daily ‘diaries’ instead. 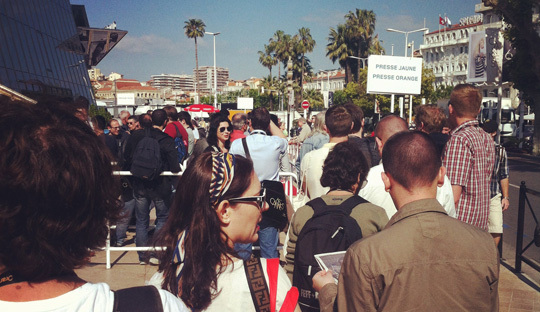 Today began like much of last year’s festival, in a 10am queue in the blazing Cote d’Azur heat. Once again granted the lowest-of-the-low press badge, I stood patiently in the familiar ‘presse jaune’ line and listened to those around me have the same stock conversation about the inefficiency of the queueing system over and over again for 90 minutes. The faintly underwhelming Dictator PR stunt happening just down the road served as a brief distraction, but most of my time was spent fuming at the audacious cunts intent on manoeuvring their way past me in the queue. Finally, with less than two minutes to spare, we were granted entry to the very first press screening Wes Anderson’s Moonrise Kingdom, the festival’s eagerly-awaited opening film. My seat to the extreme right of the auditorium wasn’t the ideal vantage point for such a meticulously symmetrical film (see diagram above) but nonetheless I’m happy to report that Moonrise Kingdom is an absolute smash. It’s a gloriously overemotional tale of two pre-teen lovers (newcomers Kara Hayward and Jared Gilman, both awesome) full of lime-soaked scenery and pleasingly stilted 1960s telephone conversations. Wears a little thin at the end but not enough that you’ll care. Tomorrow promises new ones from A Prophet writer-director Jacques Audiard and Uncle Boonme funster Apichatpong Weerasethakul, so be sure to check back for more captivating tales from the Croisette. If you’re lucky, I might even show you the ridonkulous Spring Breakers poster I spotted out on the beachfront yesterday.